North Carolina may not yet have reached a top spot on the wine connoisseur’s radar. Though many have forgotten that, prior to Prohibition, the state was among the nation’s leading wine producers. Of late, North Carolina’s number of vineyards has more than quadrupled, now boasting well over 100 wineries and three official appellations. 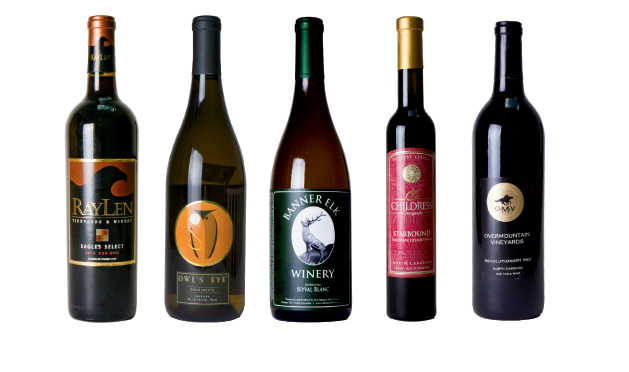 Sample a selection that signals the state’s winemaking renaissance. A French hybrid grape from the Alsatian parent Gewürtztraminer, this semi-dry white from Shelby breathes tangerines and spiciness, and can be enjoyed both at the beginning and end of a meal. Try pairing it with sautéed wild mushrooms or roasted chestnuts. A lovely floral selection from Banner Elk Winery, this French-American hybrid is tailored to survive the harsh winters of Appalachia. Notes of pear and mountain meadows pervade this wine. Sample alongside baked trout or a pear and Roquefort tart. This blueberry dessert wine from Childress Vineyards is made from North Carolina rabbit eye blueberries. At almost 18 percent alcohol by volume, it’s reminiscent of an aged port. It’s not overly sweet, and would be a perfect accompaniment to tiramisu or a flourless chocolate torte. This 100 percent merlot from Overmountain Vineyards in Tryon, a town that was a leading producer of grapes at the turn of the 20th century, is delightfully earthy and plummy, with lingering cherry notes. Pair it with an autumn dinner of baked squash and sage.